There were several things I wanted to consider when choosing the paving material for the front walk. It needed to complement the style of the house, and our family’s living style. Snow removal in winter and general maintenance had to be considered. And price and ease of installation would also be factors. Slate was already installed as the floor of the front porch, from which the front walk would begin. This seemed like the most logical choice, since it would tie in with the slate that was already there. But, I don’t know, it just didn’t seem like what I wanted for a front walk. The slate that is already there doesn’t really seem to fit the style of the house. Or perhaps the rigid formality of it doesn’t mesh with the informality of my family. I also suspected, given our poorly draining soil, that it would be difficult to do right. Anything that was going to be mortared into place would need perfect drainage or crack from winter heaving. There was also a fieldstone wall retaining the parking pad and creating Fern Alley. This fieldstone wall separates the parking pad from Fern Alley. (Consult this map to get your bearings.) This stone is scattered throughout the beds of two creeks, and we dig it up regularly in the garden. It’s certainly plentiful. But a certain family member with a two-year degree in building construction told me that the stones would all need to be at least two inches thick, and he seemed to think there weren’t enough stones of that thickness on our property–they had all been used in that wall pictured above. 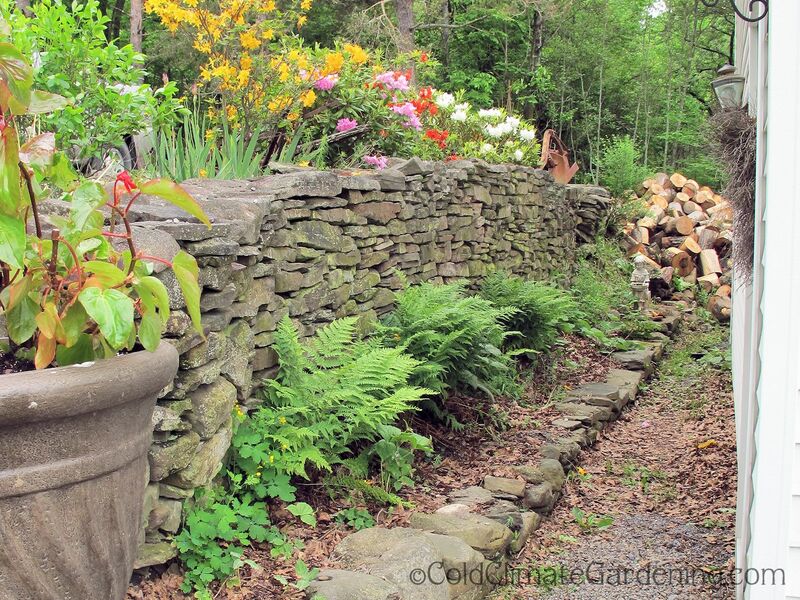 So I gave up on the idea of a fieldstone walkway, telling myself that, after all, it would be hard to keep the cracks between the stones weeded. 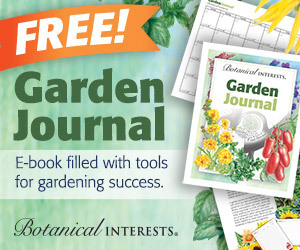 Use your imagination: can you see how the alternating shapes would allow places for plants? I thought I was all set with this plan and was getting ready to calculate how many pavers of each size I would need and how much concrete to make all those pavers. Then last weekend one of my adult children asked why in particular I wanted to go with pavers? Why not use the stone that is plentiful around here? So I told him about the two inch requirement and perceived lack of suitable stones. Scarcely had I finished speaking when another grown son scoffed and said there were plenty of good sized rocks if one had the muscle to get them out of the creek. (And these were the people I was counting on for help, so I guess he figured they had the muscle.) And then the first son said, and even if there weren’t enough, we could buy the rest that we needed. 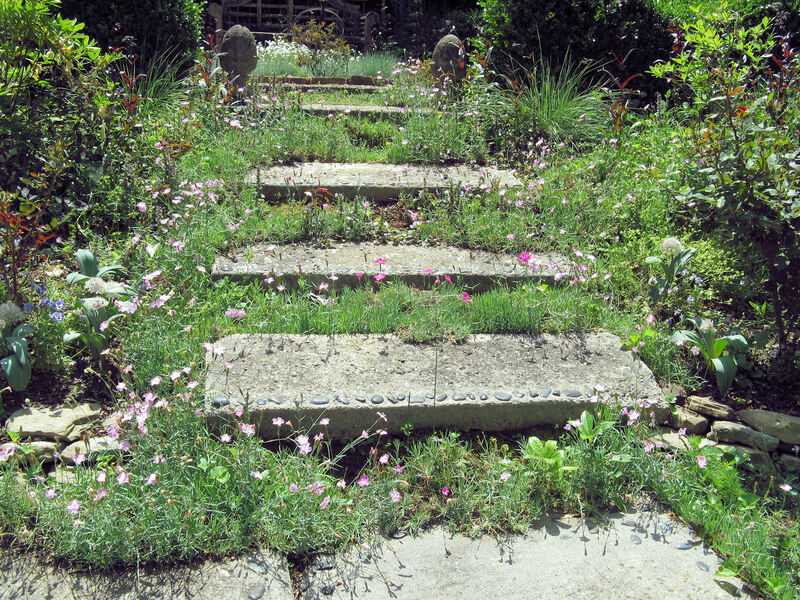 I love the dianthus and other small plants growing around these concrete paver steps. Photo reprinted with permission. I could tell by the look on the faces of my menfolk that this looked messy to them. I could see we had a differing sense of what looked pretty. I told them if the gaps between the stones were the width of my CobraHead weeder, I could keep the weeds out from between the rocks. But I did intend to have plants growing on each side of the walk. 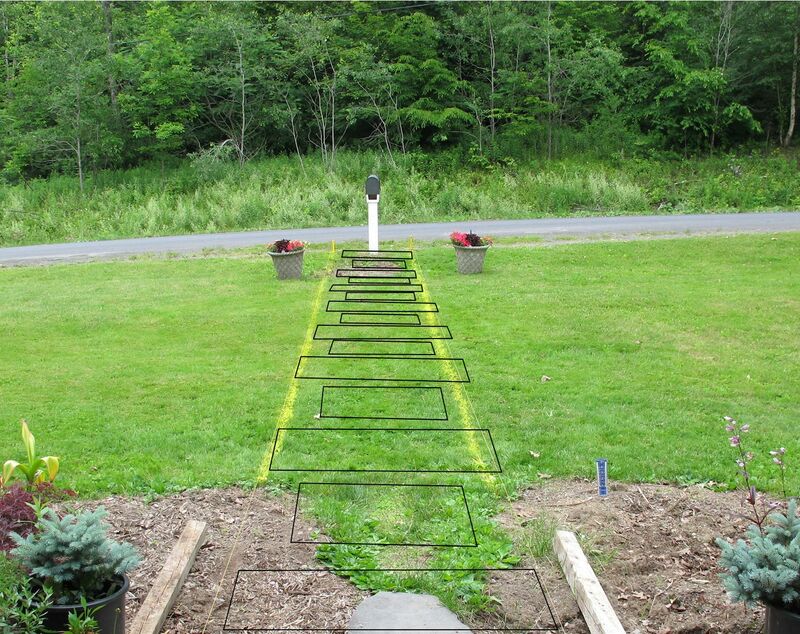 As I mentioned in the first post about the front walk, I want the walk to be the same width as the porch uprights, which are roughly six feet apart. If memory serves, it is forty feet from the edge of the porch to the edge of the road. Two hundred forty square feet of stone. That’s a lot of stone. This post is part of a continuing series chronicling how I am designing new gardens at my new (to me) house. 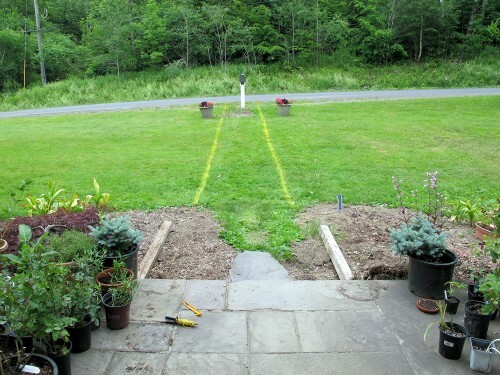 Previous posts include my one year anniversary, an overview and map of the environs, the initial front walk post, one discussing the front walk garden design, and a post that addressed a few questions about the front walk. It is very nice to see the thought and effort you are putting in the project. What is missing is what happens around the front path. Do you leave it as it is or are you going to landscape it. That should be part of the project as well. I think the one with the cracks is actually a good design. The plants between the crack will look good as long as they are maintained regularly. This is a good concept and like you said you want it to be similar to your family’s personality. Not too formal but very beautiful. I love the idea of different shaped paving stones. Will fit nicely in my English garden project. Thanks for sharing! I love your descriptions of all the practical thinking that goes on in planning any project. 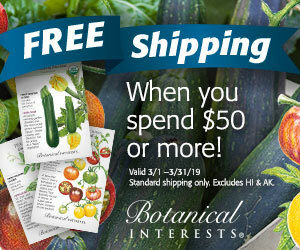 Non-gardeners just have no idea. And sometimes new gardeners don’t have much of an idea of all the implications of any decision. I continue to watch the evolution of your wonderful landscape. Iv’e done a quite a few garden projects in my time and when it comes to laying slate or slabs it must be done right i learn’t the hard way but now i no exactly what to do thanks for the tips i’m sure they’ll come in useful. It sounds like you bought a house with the same front walk option as my grandmother had … none! My cousin bought the place, sold it and that still hasn’t changed. I’m curious as to your choice. Sounds like an excellent plan, and how great that you’ve got your sons close by to provide assistance. As to plants between the pavers, maybe you could scatter, say, forget-me-not seeds in there when noone is looking. Later you can shrug your shoulders hopelessly and say it’s just impossible to keep them from filling in – you tried but it can’t be done. I love the idea of the 2 different sizes of stone…can’t wait to see what you decide as it sounds gorgeous already Kathy! I agree completely. You will love being able to put plants on either side when stones are smaller. I love it. That is indeed a lot of rock! But if you have offers of muscle power and think it can be shoveled easily enough I think your vision of a few encroaching plants sounds lovely. Does this mean if you need to shovel snow off you have to scrape each piece ? I am moving soon to a cold climate from Miami and the prospect of how one might shovel a gravel driveway boggles me. Haha. Probably not funny if it’s icy. So I am listening to all the advice very carefully. I am glad you are giving plenty of thought to your pathways. As someone who has stuff growing in between pavers I have to say that I don’t think that this idea combines well with grass. I vote for planting either side of the walkway. Is there a slope to the road? Would it be necessary to make a step or two at some point? I think you could do the offset pavers and put some deep gravel in between. This would be fairly easy to keep plants from growing in. A long straight concrete path would be rather boring. Look forward to hearing more on this project. I think that’s a nice compromise to have some plants growing along the path but not in the path. Let the rock-gathering begin! I think the biggest issue would be finding enough flat pavers to make snow removal easy…Have you thought of combining pavers with slate or concrete; maybe edging the concrete path with the pavers? I do look forward to hearing what you decide. This is gettinginteresting! 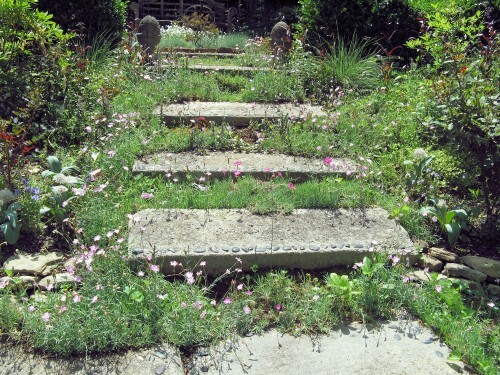 I agree, the concrete steps in my garden can and do often look messy, but that is how to let plants form and cast about the seeds, filling in and creating the mass planting. The yin and the yang. It would be helpful to see the area you want to build the path from the post box to the house. You want it ot tie into the colors, design of the house, and the landscaping you have in place around the front of the house. I had to laugh about the menfolks thinking the look you want is messy. The Executive Producer here at Wit’s End does not understand cottage garden style and has been heard to lament the unruly nature of my paths.